Live traffic cam from TransGuide. Image refreshes every few minutes or so. 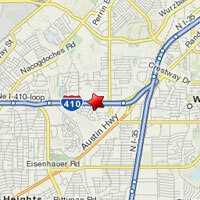 Workers closed all main lanes of westbound Loop 410 at Starcrest for the weekend. Motorists must exit at Harry Wurzbach and re-enter past Broadway. The busy stretch of highway is sure to coagulate into a nightmare shortly after sunrise. Crews are putting drivers through the hoops so they can place rebar onto a Nacogdoches Road bridge deck. The work is part of a $119 million construction project, the city’s largest, to widen that part of the freeway to 10 lanes. The job so far is on schedule and should end before the year’s out, according to the Texas Department of Transportation. “Everyone will reap the benefits,” an official said. Also bogging down this weekend is eastbound Loop 1604 at U.S. 281. Workers there will close a lane through 1 p.m. both Saturday and Sunday to repair a bridge joint.